Saijinki Kakusei was from Karyō of Seisen (Xichuan Jialing) and was a mercury seller traveling throughout the provinces for his trade. As with Ryohō, he learnt the art of the use of the hōtengeki. One day his boat was capsized by the wind in Kōga (Huang he), and although he escaped death, he was unable to return home. While wondering what to do, Kakusei heard about the robber Ryohō, who also used hōtengeki, and decided to meet him at the foot of Taiei-zan (Duiying shan). They then began fighting but were equally strong (see Ryohō). 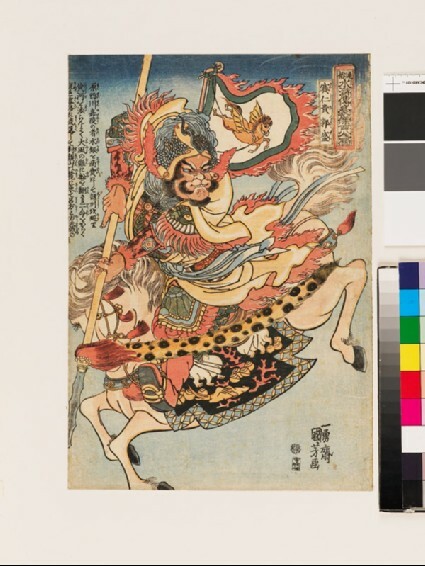 This print shows Kakusei armed with his spear on a plunging horse with a banner depicting a Pegasus-like horse. This forms the left part of the diptych while Ryohō's portrait forms the right (9) [EA1971.95].